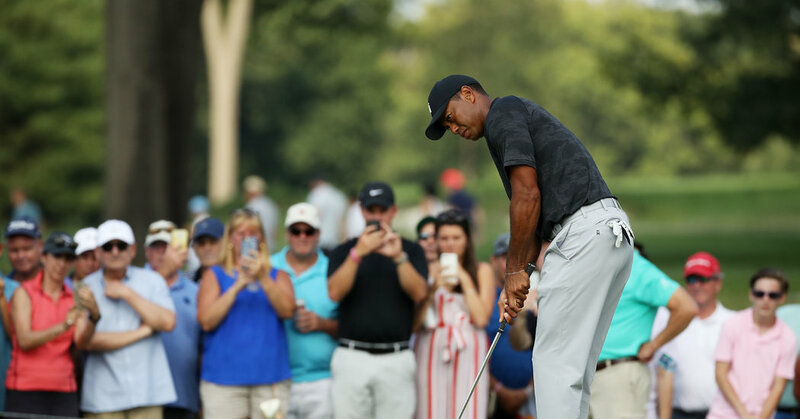 PARAMUS, N.J. – Tiger Woods had a long finish for the day when Keegan Bradley's final putt for a 62 came to set the course record at Ridgewood Country Club on Saturday. But Woods knew there were low numbers out there. He just could not beat well enough to shoot himself. After Woods's first rounds flirted with the cutting line, his performance on Saturday was an improvement. He played for the first time throughout the season without Bogey, his comeback campaign after a spinal fusion surgery. But with drier conditions and less wind in Ridgewood, the players took advantage and Woods was disappointed that he had failed to do the same. "I've only had eight birdies for the week, and that will not work," Woods said. "These guys are doing a shipload of birdies, I just did not do any of them." Indeed, the afternoon's score plummeted. Bryson DeChambeau scored 63 to 16 and led the tournament with four strokes. His game might have attracted more attention if Bradley had not topped Hunter Mahan's 10-year record of nine for a round. Bradley moved up to 12th place in the second place for the tournament. Jordan Spieth, who said he had struggled to find a stable swing, nevertheless scored 64 to feed in a tie for Seventh. Two elite players who really had problems were Dustin Johnson and co-leader after Round 2, Brooks Koepka. They shot 72 each. Woods spent nearly an hour on the practice green after Friday's Fridays, trying to find his punch. But on Saturday he missed seven birdie putts from 14 feet. It was a recurring theme this season. When he got the week, Woods took the 80th place with an average of 10 to 15 feet, making only 31.2 percent of his 109 attempts in this area. He said he saw the lines on many of his putts on Saturday. 19659002] "I called Joey a couple of times this week and said, 'I see three different breaks here,'" Woods said, referring to his caddy, Joe LaCava. "I encounter these places where I have double crushers, or if not three times broken putts, and I do not see or feel right," he said. "You know, just one of those weeks." Woods got some comfort from other aspects of his game during the week. His drives, which took him in an otherwise sensational final round of P.G.A. Championship two weeks ago, have come back into shape and find 64.2 percent of the fairways. He switched his driver's shank to something that seemed familiar to him, and he no longer hesitated to swing it. And his iron game was strong too. He led the field on Friday and hit 16 greens in the regulation. On Saturday, his approach shots left him an average of 11.5 feet out of the hole. But his inability to sink these cherubs has kept him from making a serious charge. "I made a great impact on Bellerive," Woods said, referring to the PGA Championship website where he finished second. "I just did not feel or pace this week." Earlier in the season, Woods' putting was so bad that he had swapped his bag and replaced his Scotty Cameron blade with a Mallet putter from TaylorMade he has since needed. But Woods did not blame the club for its suffering. "Did I hit some bad putts? Of course," Woods said. "But for some reason, I just do not see the breaks, just one of those weeks when even the good guys get on their lips, they do not go together, they get retired." DeChambeau, 24, becomes a dominant on Sunday third round after his third PGA Tour title search. "I just felt every time I hit I on the fairway, I attacked flags," said DeChambeau, who shot 68-66-63. "My golf swing felt great, and my putting, that was the key for me this week." Spieth said he felt a sense of relief after his round when things finally began to clash for him. He spent two hours on the practice area after the second round on Friday, he said, but his swing was not as he had hoped. "I wasted two hours of my life there," Spieth said  However, the momentum was good enough to position him to make the putts he needed. "Today was a round in which the results finally came," said Spieth. "It's nice to see it in a round like today." Bradley, 32, also played a bogey-free round to upscale the ranking. He was a St. John's alumnus and said he had played in Ridgewood as a kid and that he felt just as comfortable on Saturday as he did then. "I was feeling calm all the time," Bradley said. "That's exciting, because if I can go on like that, I think I can play well again tomorrow."